I created this birthday card for a friend who lived in Hawaii for many years. 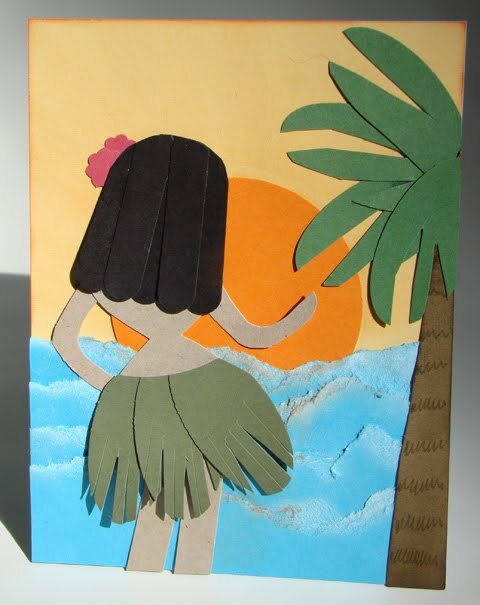 The hula girl is created completely out of punched shapes. My inspiration came from the very talented punch art artist, Ellen Kemper. I have changed out some of her pieces and added the sunset background. If you would like to see Ellen’s original card, please check HERE. The following is a description of the pieces I used to create my card. Palm Leaves: 1-3/4” x 7/8” Oval with hand cut to resemble palm fronds. Stampin’ Up! Supplies: Ink: Pumpkin Pie, Craft White; Card Stock: Tempting Turquoise, Pumpkin Pie, So Saffron, Soft Suede, Garden Green, Always Artichoke, Crumb Cake, Rose Red, Basic Black; Punches: Butterfly, Word Window, 1-3/4” x 7/8” Oval, 2-1/2” Circle, Itty Bitty Shapes; Sponge Daubers, Soft Suede Marker. If you have a question, please leave me a comment and I will update my blog with your answer. Thanks for visiting! !